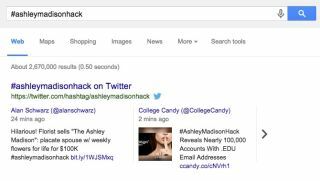 Real-time tweets served alongside Google search results? Sounds like a pairing nearly as good as wine and cheese, if you ask us. Today, this snackable info combo came to be as Google added tweets to its desktop search results (the feature was already available on mobile), serving up Twitter content relevant to your queries. Searching for "Donald Trump" brings up a feed of The Donald's tweets, starting at the most recent (38 minutes ago at the time of writing). You can scroll through to see past tweets, too. Typing "#ashleymadisonhack" pulls up tweets using the hashtag, while searching for "techradar" will pull up yours truly's account. Trending hashtag queries appear to pull up tweets as the first result, while other searches place the tweets in different places on the results page. Pulling up-to-the-second tweets in search results makes sense, not only for users to see the conversation taking place around whatever they're searching for, but for Google and Twitter, too. Twitter gets more eyes on its tweets, while Google's results become more dynamic. Rumors have persisted for years that Google has designs to buy Twitter. Maybe this is but another step in the two's courtship?